GiveWell, the independent charity evaluator, has released their latest updated charity evaluations and we are pleased to report the Against Malaria Foundation is rated as one of the top five charities in the world and the world's leading malaria charity. We are currently rolling out an extensive Post-Distribution Survey (PDS) programme with our distribution partners that will track the level of continued use of the nets so further malaria education can be carried out in distribution locations if necessary to ensure high levels of net hang-up. It is not just the initial use of nets that is important but the continued use of nets. We are also looking at providing public feedback on the performance of our distribution partners. We expect to have progress in this area in the next few months. As part of a distribution of long-lasting insecticidal nets we require a post-distribution report. These reports should describe all the stages of the distribution and be completed within a few weeks of the distribution being carried out. We have just had two fantastic examples of such reports detailing the preparation and planning that is the basis for a successful distribution and the challenges and lessons learnt in carrying it out. The first is from Global Minimum for a distribution of 10,560 nets in Sierra Leone in August and the second is from Concern Universal who distributed 9,600 nets in Malawi last month. Both distributions have been carried out extremely competently. You can see both of these 'immediate reports' by following the links above. Wow! 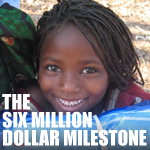 We have passed $6m raised! Eden UCC in Illinois, USA donated the dollars that took us through that total. Every donation from every person counts as the total of $6,000,042 from 39,343 different donations and transactions and from 450,268 people participating indicates. To celebrate we have put together a list of all the milestones we have passed on the way. See if you feature in the lists! At the time of the Haiti earthquake in January 2010 the immediate need was for rescue teams, medical aid, water, food and shelter. The relevant authorities assured us there would also be a need for nets in the medium term. That time has now come and 20,000 nets have just arrived in Haiti. Our distribution partner, Partners In Health, have picked up the nets and they will shortly be given out in 14 communities across Port au Prince, the Central Plateau and the Artibonite regions where they are required most. Over the coming months we will be updating the distribution page with more information on the distribution. Tanzania is one of the countries worst affected by malaria and the majority of the country is malaria endemic. Approximately 200 boarding schools across Tanzania, where some of the poorest students in Tanzania are educated, are receiving nets to achieve blanket coverage. Boarding schools in Tanzania, unlike some in Western countries, are very poor. The nets are funded by Rotarians in Canada and the distribution is via a partnership between Rotary Tanzania and PSI Tanzania. There have been several phases of distribution starting in August 2008 and it is now nearing completion. Do you have some spare time for a good cause? Do you write well? If the answers are yes then you might be able to help. We are looking for people to write short posts for this blog highlighting events and news about Against Malaria and malaria in general contact us! There are other areas involving a wide range of skills. We have just edited and uploaded footage from two distributions in Tanzania. These 90 second edited highlights show the demonstration, distribution and installation of the nets. This has achieved coverage of all sleeping spaces in the towns of Ahakishaka and Nyakagoyagoye. You can view the videos on our video page, YouTube channel or directly from the distribution page where you will find more information and photos of the distribution. 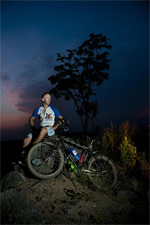 Peter Gostelow, who has been cycling from London, UK to Cape Town, South Africa, has now reached Nigeria! Peter has personally helped to distribute nets which his adventure has funded when he passed through Sierra Leone in July. He has cycled through more than a dozen countries since he left the UK in August 2009 and regularly posts fantastic photos and journal entries to his Big Africa Cycle website. He also gives talks in schools, clubs and organisations about his experiences, fundraising activities and to help increase malaria awareness. Madness Against Malaria is down to two teams. The Beantown 'Skeeter-beater Tetra-peaters have won the competition 3 years running and are aiming to make this their 4th title. This year they are up against newcomers Nests Shop who have been one step ahead of the current champions all through the final with lots of back and forth. As I write the two finalists have raised over US$ 5,000 between them in the final round alone! That is enough to buy nearly 1,200 long lasting nets, protecting 2,400 children, on average. Currently Nests Shop have the edge, but only by 27 nets! With only one day to go who will prevail? Check out the teams and lend them a hand! 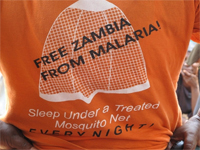 Now is the perfect time to swim and help in the fight against malaria! There are only a few weeks to go before World Swim 2010 starts; a great time to register your swim, tell friends and family and get involved.